I have kicked off lots of new - but little - projects. 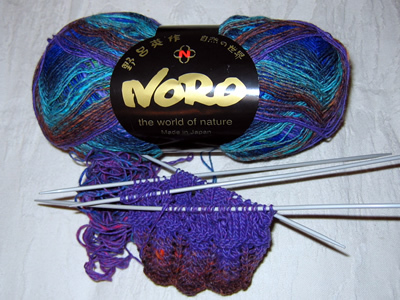 Alison gave me a ball of Noro's sock wool; it is lovely and I don't know how I managed to contain myself for so long. I am using one of the Vintage Sock book lacy patterns. I thought at first that a plain design would be better but having viewed some samples that others have knitted, I think it will look good in this design. This will make Alison laugh if no-one else: the initial two colours, these particular shades of purple and brown, remind me immediately of the vivid colour splash scenes from "2001, A Space Odyssey". The technique of flooding the screen with negative style colours and odd filters was very popular in the 1960s (drug culture I expect), and this film used it for the scenes travelling "beyond Saturn". The one I remember, through the spaceman's eyes, was a simple scene of a chalk cliffs and rough seas - but all filtered into purple and chocolate colours. 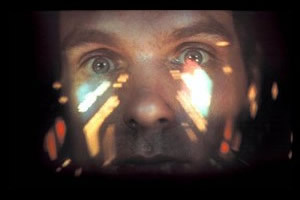 Although it was simple to understand the filming technique, I was totally "there" in the spaceship, captivated by the wide-screen cinema; the effect of being in such an alien landscape - familiar yet awful - was utterly beautiful and at the same time horrifying. I do wonder if it's all in my imagination, as I saw the film some 30 years ago, and even then it was 10 years old. Amazing that it was still capable of such an impact. I do not (happily) retain any horror of the colours themselves! You are, of course, absolutely correct - I did laugh. I have now, however, actually seen the movie. I imagine that watching it in the cinema (before the current computer enhanced graphics were normal) is a somewhat different experience from watching it on TV, in my living room, explaining it to 2 small boys!